Let’s kickstart this week’s intraday charts update with a couple of chart patterns on EUR/USD and EUR/CAD. 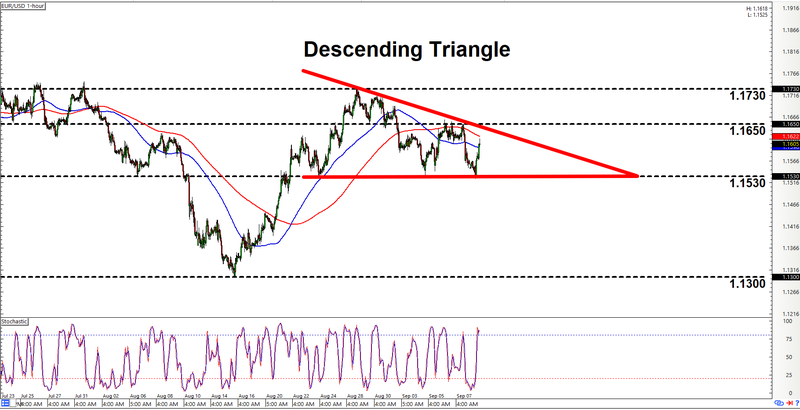 If you’re a breakout chartist, then check out that there descending triangle on EUR/USD’s 1-hour chart. As the name implies, a descending triangle is a bearish chart pattern. We’re therefore mainly bearish on the pair. And the basic play is to look for an opportunity to go short if the pair breaks lower past 1.1530, with the area of interest at the 1.3000 major psychological level being the most likely destination. And looking at technical indicators, they appear to support further downside moves since them moving averages are in downtrend mode. Stochastic, meanwhile, is already signaling overbought conditions and all that. However, there is always a risk that the pair may break to the upside instead. And all the more so, given that the trend before the triangle formed was an uptrend. It would therefore be a prudent for y’all to prepare for a potential bullish scenario as well. If a bullish scenario does play out, then clearing the area of interest at 1.1730 would validate the topside breakout. A move higher past the 1.1650 minor psychological level would be an early sign that bulls are taking control, however. If you’re more bullish on the euro (or bearish on the Loonie), then heads up ‘coz there is an ascending channel on EUR/CAD’s 1-hour chart. And presently, the pair is making its way up after testing the channel’s support at 1.5210. Y’all may therefore wanna decide quickly if it’s still worth it to look for a chance to go long or not. But before you do, just note that the pair is already hesitating after hitting the area of interest at 1.5280. Moreover, stochastic is already signaling overbought conditions. 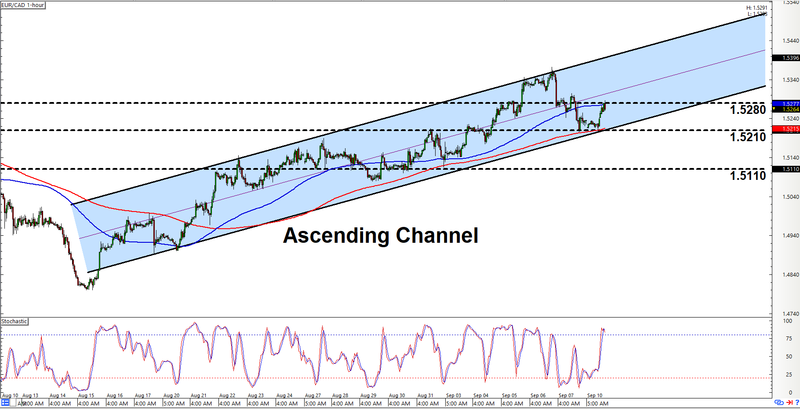 There’s therefore a chance that the pair may move back down to retest the channel’s support. However, that also means that there’s a higher-than-average chance for a downside channel breakout. Y’all may therefore wanna plan ahead for such a scenario as well. The pair would have to smash lower past 1.5110 in order to validate a downside breakout, though.